I’m a fan of your writing. It’s more like conversation; so, it’s very easy to follow. I have read all of your Monk books. When I saw the write-up for True Fiction, I knew that I was going to be on another adventure. This time with Ian Ludlow. Keep up the great work. p.s. Someday I may catch up on your other books. Right now, the majority of my reading is is the history, historical fiction and spy genres. Both Monk and Ludlow have been good diversions from my norm. That’s great, I can’t wait to read the book. I follow a couple sci-fi writers (Walter Jon Williams, Charlie Stross), and they both can barely stay ahead of the weirdness. Near-future fiction has become a fairly perilous niche. And spare a thought for the writers of the Onion, who are in danger of being made surplus by the current administration. Congrats on all the recent Good Stuff. 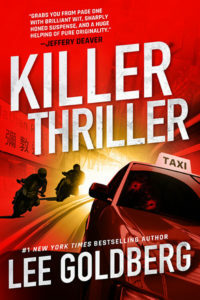 Are you entering the ThrillerWriters’ Newsletter book giveaway with your new book. I hope so. I look forward to read it. If you’re a ThrillerWriter member you can do so I believe. AGain really enjoyed Mystery 101, think that’s the title. Am watching a French thriller series on Mhz Murder In and start questioning what title is for which series or book.